In January 2016, the old CMU system was replaced by the new Protection Universelle Maladie known as PUMA for short. In a nutshell, here are the main points about accessing the French healthcare system. Getting your ‘green card’ in France. Is it really that Vitale? One of the key questions when moving or living in France is your health care rights. The French healthcare system is actually quite simple and it has a very good reputation however it’s true that when new to France, it can all seem a little bit too much. The main questions revolve around how to get the notorious carte vitale. Why does it take so long? Can my family be covered? What documents do I need? It’s true that obtaining this card is the subject of many heated conversations between expats, but if all your paperwork is in order, you can get a carte vitale reasonably quickly. For more complicated cases it can take much longer and I’ve taken on some cases where people have been waiting for 18 months, hence the bad reputation for getting this ‘green card’. As a relocation specialist and an expert in many of the different processes in France, the answers to these questions are relatively simple. To get more information you can check out the CPAM website www.ameli.fr website but I have tried to simplify the information into something understandable and quick to read. What is a Carte Vitale? I have put this as the first question as most people think that having a carte vitale gives them access to health care in France. This is not true. And yet, everyone wants one. The carte vitale is really just the card that facilitates your reimbursements and avoids you having to pay upfront for your health care. Before you can have a carte vitale, you need to be ‘in’ the French healthcare system and your healthcare rights need to be activated. These are two separate processes and the first priority is to ensure that you are in the French healthcare system. Once your rights have been opened, you can then ask for a carte vitale. Also, you can add your beneficiaries & dependents to your health care rights ie husband/wife & children. If you wish to add your partner to your health care cover, they would need to be ‘inactive’ ie be dependent upon you. TIP: As getting the carte vitale can take some time always ask for an ‘attestation de couverture sociale’ which proves you have access to health care in France whilst you are waiting for your carte vitale to be processed. 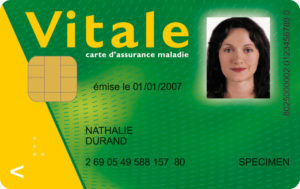 Note that a carte vitale is not given automatically once you are in the health care system. You need to ask for it and follow up. If you wait for them to contact you, you will be waiting a long time> Believe me, I am talking for experience. I have dealt with cases that are securely in the health care system ie they have validated their rights but after 18 months are still waiting for their carte vitale. This is generally because either they haven’t asked for it officially, or they haven’t followed up one of the many letters asking for documents. What are my options for accessing the French healthcare system? Each of these people have one thing in common, they have paid or are paying their cotisations sociales. These are the equivalent of your national insurance contributions ie they are paying into or have paid into the French healthcare system. If you are the husband, wife or child (under the age of 16) of a salaried person, business owner or retiree, you can also gain access to healthcare rights. Of course, again, this doesn’t happen automatically, you need to fill in the forms. If you relocated to France and are working as an employee, you will have health care coverage in France. Not a problem. However, you need to apply for this via the CPAM (Caisse Primaire Assurance Maladie). Your company will sometimes do this for you but they are not obliged to by law. So if you do nothing, you will not have health care cover and ultimately no carte vitale. It’s the responsibility of the employee to complete the paperwork. This is the big mistake of most new employees in France, they think the paperwork is taken care of for them, and that’s rarely the case. You have access to the health care system from Day 1 of your business set up. You will receive a letter of ‘affiliation’ from the RSI and you will need to provide them will various documents to prove your civil status. So prepare your document list in advance. For both salaried and business owners, you will receive a temporary social security number whilst your file is being validated by the SANDIA. Once validated by the SANDIA, you will be issued with a carte vitale. Again, this doesn’t happen automatically, you need to follow up regularly. The carte vitale is not issued by the RSI or URSSAF. These are the government authorities that take your social contributions. The processing of your carte vitale is done by the mutuelle that you chose when you set up your business activity. This could be the RAM, Harmonie Mutualité, Mutuelles du Soleil or another government agreed service provider. For most non-French inactive or early retirees, you can access the system. The most likely choice has always been the CMU. This basically was the option for most people who didn’t fall under the other categories. They took into account your previous years’ income and then charged you 8% of anything over and above €9,601. The problem with the CMU was you had to be a resident for 5 years to request it. Other times they gave it to you without fulfilling this criteria, a bit of a strange system to say the least from an affiliation perspective. La loi de financement de la sécurité sociale 2016, voted on 21st décembre 2015 to replace the CMU by the PUMA. See section d) Resident in France for more details. If you are a retiree who is receiving a pension from another country, you can ask for your healthcare in France. You ask for the S1 form from your country of origin and then complete Cerfa 60-3406 Declaration en vue de l’immatriculation d’un pensionné. You will have to provide proof of the pension you are receiving, along with the usual documents: birth certificate (translated), passport, proof of residence & pension. They take about 4-5 weeks to affiliate you into the healthcare system and then another 3-4 weeks to get your carte vitale. The CMU (Couverture Maladie Universelle) has been replaced by the PUMA (Protection Maladie Universelle). Confused? Well so are a lot of people right now. It was created to simply access to health care and avoid being cut off if you changed from one regime to another. It is access to health based on residency in France. So if you have been in France for more than 3 months and can prove this, you can apply for the PUMA at the CPAM. The CPAM will affiliate you for health rights but it is the URSSAF which will take the ‘cotisations’ for access. As I said above, healthcare isn’t free; you need to pay into the system, how much you pay will depend on your previous years’ earnings. Under the CMU system, you paid 8% over and above 9,601 euros. Under the PUMA it is difficult to get an exact number at the moment from the URSSAF but from what I have researched if you earn over 9,654 euros you will contribute via the URSSAF. The percentage will be about 8% but again no definite confirmation as yet. So yes, you can apply for this and you will get access to health care via the CPAM quite quickly. However the cost needs to be calculated. The CPAM confirmed that this would be free for retirees. Again, it’s not that difficult but it can seem like it when reading the different websites on the subject I admit. So basically, you need to be registered with a local GP. You do this by getting your doctor to sign the Declaration de Médecin Traitant. This is one of the documents that you will be asked to hand in to access your health care. I certainly hope this has helped answer a few of those niggling questions. If you need any help, don’t hesitate to get in touch. FrenchEntrée contributor Tracy Leonetti is a French red tape expert with over 20 years of experience helping people deal with french administrative problems. Both for people moving to France or already living in France, Tracy provides invaluable help with child benefit payments, small business set up, car registrations, utilities set up, and healthcare registration, to name just a few. Hi Tracy, thank you for this straight forward and very informative update. It certainly dispelled some myths for me! I wonder if you could answer a question for me. I will be moving to France this year and setting up a gite business. I intend to run the business under the Micro-BIC regime for “gite rural”. What would be the best or most applicable method to enter the heath care system? I have a carte vitale and get 100% cover because of breast cancer. I now need to have a hip replacement, which is to be done in July. I want to find out the total cost of the operation, and if the 100% cover would cover this operation. We are close to Gourin in Morbihan I need to know where the office is to apply for the Carte Vitale. The S1 is something new to me, will have to struggle through .gov.uk and where do I get hold of the Cerfa form? Frequently find that my french is inadequate for many things which leads me to being very anxious about all of this. We are both retirees with basic state pensions and my husband has a small work related pension. Need positive advice to help me through this maze. Thank you. I have had a Kidney and part of renal vein removed due to it being a cancer tumour , I have a form to take to CPAM for 100% can anyone help ,I have a top up insurance and am wondering if I will need it now , anyone been in a similar situation and could help me with this . Help still confused! I have been in France for 7 years and entered the health system under the inactive scheme (retired early on private pension and pay tax in UK) every year except for this one I have received a letter from CPAM asking me to provide proof of continued residence in France and proof of income my bill from URSSAF then arrives and I continue to be in the system, my question is do I actually need to do anything now that PUMA has arrived as have received no communication from CPAM. Thank you in anticipation that you will know the answer. I can’t see section D), which you refer to in your post. We are early retirees with no private or state pensions due to us for another 10 years. We will be living off our savings and will not be working in France. We want to know if we should go down the PUMA route or apply for an S1 from the UK. What will we be classified as, under the French health care system? We do not expect anything to be free. Hello Tracy, not sure if I’m in the right place to comment but needing help! My partner is a French citizen and we have been living in Australia for just under 3 years. she fell pregnant and her health insurance in aus dosent cover maternity/pregnancy and its to late to add onto her policy, so we have decided to go back to france for the birth. We have been in france now for over 4months staying with her parents not working.Yesterday she received a letter saying she wont be covered for hr pregnancy in france as she has been residing in Australia, is there anyway around this? thanks!